Map, Hampshire, scale about 4 miles to 1 inch, altered from the map by Christopher Saxton, 1575, published by Philip Lea, London, about 1689 and 1693, then Willdey about 1732, Jefferys about 1749, Dicey about 1772. 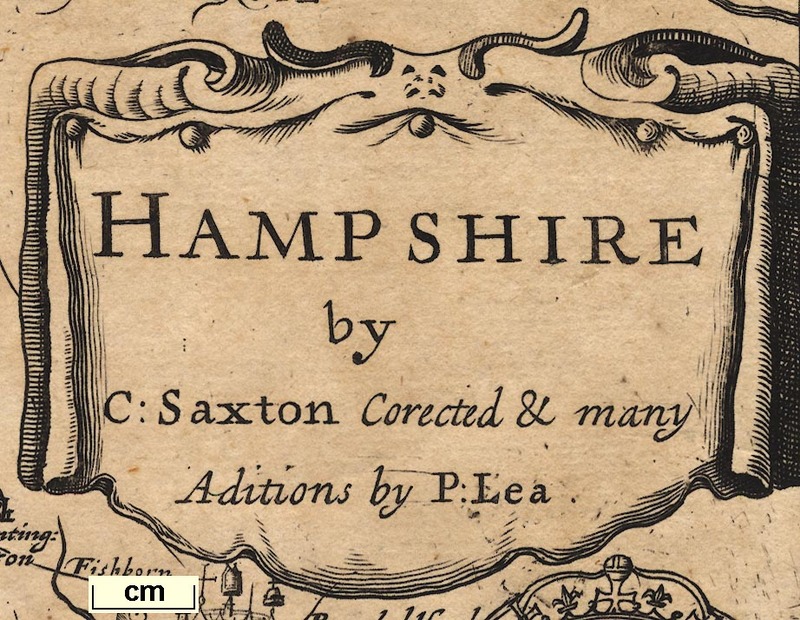 Published in 'All the Shires of England and Wales Described by Christopher Saxton Being the Best and Original Mapps With many Additions and Corrections by Philip Lea. Sold by Phillip Lea at the Atlas and Hercules in Cheapside near Friday Street and at his Shop in Westminster Hall near the Court of Common Pleas where you may have all sorts of Globes Mapps &ct.' about 1689. Published in 'The Shires of England and Wales Described by Christopher Saxton Being the Best and Original Mapps With many Additions and Corrections Viz: ye Hundds, Roads, &c. by Philip Lea. Also the new Surveis of Ogilby, Seller, &c. Sold by Phillip Lea ...' about 1693. Lea's alterations are part of a continuing process of enriching Saxton's plates, and altering Latin to English, this began about 1665 though the plates were not printed then; the additions are mainly from Speed's map. Changes made to the plate by 1665:- coat of arms of Elizabeth I and the title cartouche replace by an inset map of Winchester; 5 coats of arms added below the scale - Clinton, Saer Quinsey, Hugh Spencer, Lodo. Bruget - Earls of Winchester and William Paulit Marquess of Winchester; 4 coats of arms - Bevois, William Fitz William, Thomas Wriotheosley, Earls of Southampton, plus 1 blank, and the arms of Charles I, replace Seckford's; dividers removed from scale line; new title HAMPSHIRE; hundreds added; index letters across top and down left side added; extra place names in adjacent counties added. Changes by 1689:- roads are added; settlement symbols have marks, cross for markets, crowns for parliamentary boroughs, mitres for bishoprics. This is one of the earlier maps of Hampshire to show roads. Changes by 1693:- coat of arms of Cha. Fitz Roy D added in the blank shield. Published in a french edition 'Atlas Anglois contenant Les Cartes Nouvelles tres Exactes Des provinces, Duches, Comtes, & Baronies du Royaume d'Angleterre. Le tout Enrichi des Plans des Villes & des Armes de la Noblesse. London, Par P. Lea.' about 1693. Published in 'The Shires Of England And Wales Described by Christopher Saxton Being the Best and Original Mapps With many Additions and Corrections Viz: ye Hundds, Roads. &c. by Philip Lea Also the New Surveis of Ogilby. Seller. &c. ... Sold by Geo: Willdey at the Great Toy, Spectacle, China-ware, and print Shop, the Corner of Ludgate Street near St. Pauls London.' about 1732. The Hampshire map now bears Willdey's imprint but is otherwise unchanged. The maps remained available up to 1766; a catalogue of Jeffreys's stock included 'Saxton's Counties, being the Oldest Maps of England extant, ...', this an early example of trying to sell obsolete stock by their antiquarian interest; the Willdey imprint is erased.